We carry lovely grosgrain, satin and organza girl's hair bows and headbands as well as monogrammed personalized sun hats. We offer monogrammed personalized hair bows, monogrammed personalized headbands, and hair bows and headbands for infant baby girls to big girls, including infant bows, small bows, medium bows, and large bows. 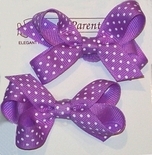 We offer satin bows and organza bows for special occasions, as well as grosgrain bows and bows in designer ribbon. 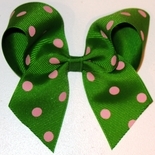 We also carry bows on pony'os, hair streamers, korker bows and flowers. See our newest addition of crocheted "skull" caps and sun hats. All of our bows are handcrafted and custom made with 100% polyester ribbons that are especially suitable for constructing hair accessories and hair bows. Use of only the highest quality ribbons insures that our products are durable and "hold up" year after year, washing after washing. Hair bows, headbands, and hats are NOT RETURNABLE for hygiene reasons. Please be sure of these items prior to finalizing your order.